I will post her projects in a Project post. She did much of the work on all of them this year. I am still assisting with wiping the projects off with a bit of mineral spirits and also some of the fine tuning. But she will be there soon. My hope is to get my new lathe set up in the 2 to 3 weeks and once I get familiar with it to get her working on it at least once a month or so this year so there is not a huge gap between when she is using it. This will all of course depend on how busy we are. But time at home and together is one of our goals for this year. 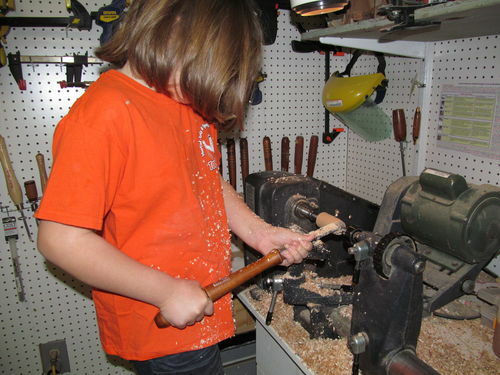 Nice that you got your little girl into turning, it’s a lot of fun. 6 words- Full Face Shield, Dust Inhalation Protection. You’re raising her right. Keep it up. Thanks. I so enjoy the time with her. And the looks on the people’s faces that she gives the stuff to is just great. As to the hints, it is very hard to find items to fit her. The face shield that is there is just to big and bulky. I am hoping to talk to some folks this weekend at the Woodworking Show about options for both. If you know of any place to but the items in a small enough size please let me know. That is priceless. It’s great that she is so interested in some woodworking. Only wish my children were. I guess I’ll have to wait for the grand kids.